An incident which occurred 120 years ago this month made headlines across the state of Indiana and gained national attention. An obscure reference to the time in 1895 when “Democrats and Republicans fought like beasts of the forest” was included in the chapter on Governor Claude Matthews in the book, The Governors of Indiana, Gugin, 2006, [call number Ind. 923 G721]. A bit more research led to the re-discovery of an epic veto battle between Indiana Governor Claude Matthews and the Speaker of the Indiana House, with the Governor’s private secretary Myron King caught in the middle. The editorial column on page four of the March 15, 1895 Jasper Weekly Courier informed readers of the assault and battery committed upon Myron King earlier in the week as he tried to deliver a veto of a controversial bill to the Speaker of the Indiana House of Representatives by the midnight deadline. 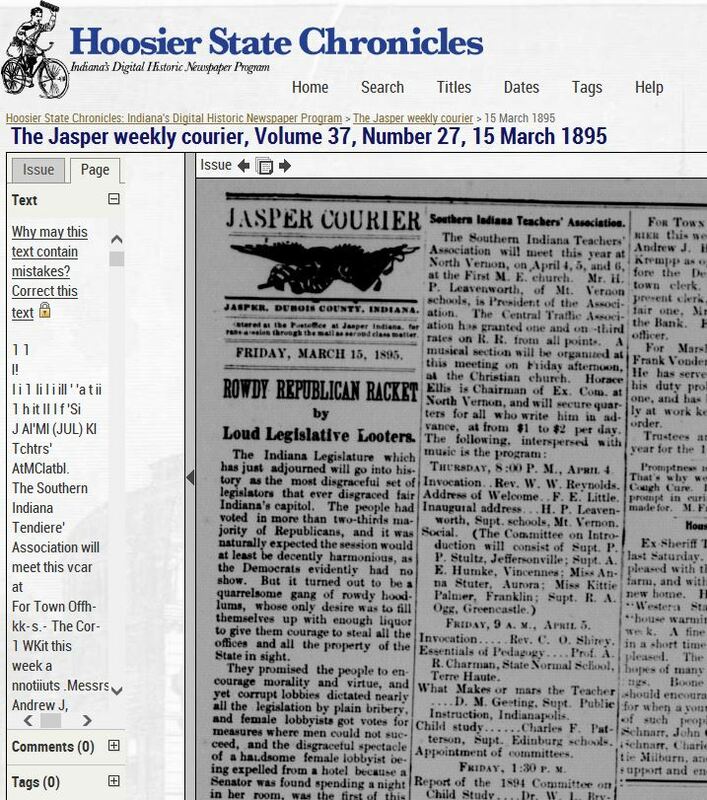 The Jasper Weekly Courier, a Democratic leaning newspaper, set the tone with the alliterative editorial section headline, “Rowdy Republican Racket by Loud Legislative Looters,” recounting a laundry list of alleged offenses committed during the previous weeks and in the final minutes leading to the adjournment of the 59th session of General Assembly on March 11, 1895. 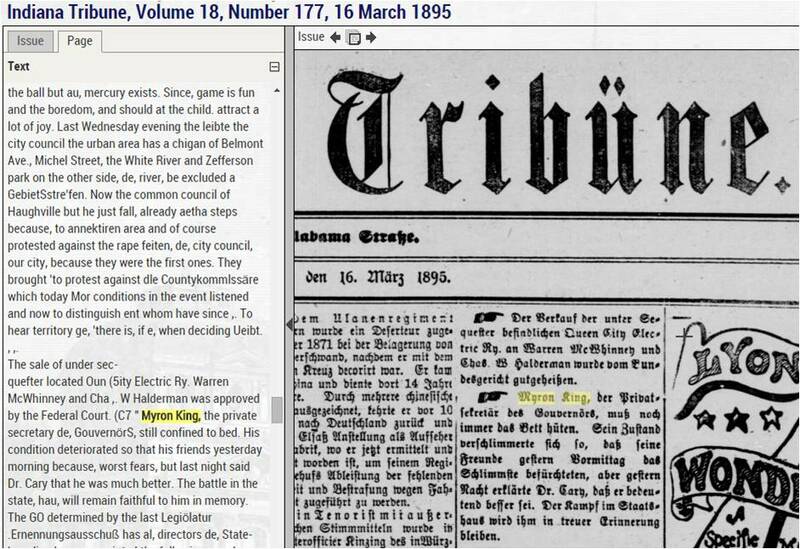 Even the Indianapolis German newspaper, Indiana Tribune, covered the events throughout the week of March 11th by including an update on Myron King’s condition on page one: March 16, 1895 Indiana Tribune. 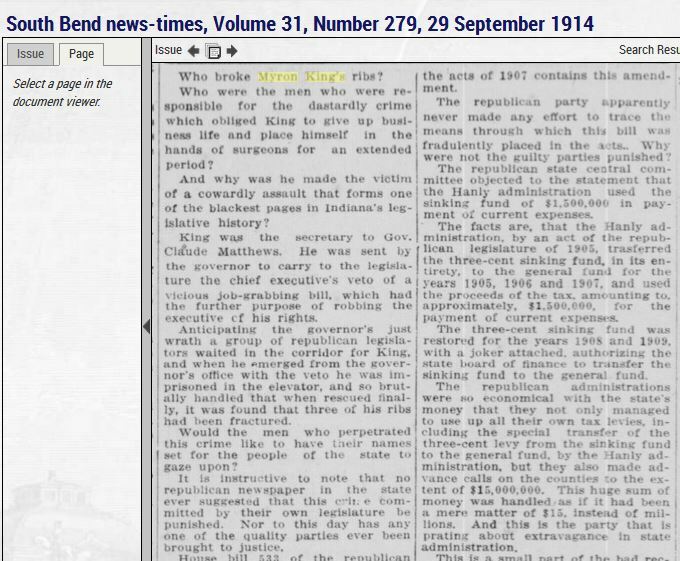 Research Tip: When using the Hoosier State Chronicles with the Google Chrome browser, it can translate the OCR text automatically. As with most automatic translation software, there will be grammatical glitches due to OCR imperfections and language nuances. Another source to access digitized newspapers is the NewspaperArchive database. This subscription database is available for on-site visitors to use at the Indiana State Library. A search found the April 6, 1909 issue of The Indianapolis Sun which recounted the 1895 incident. 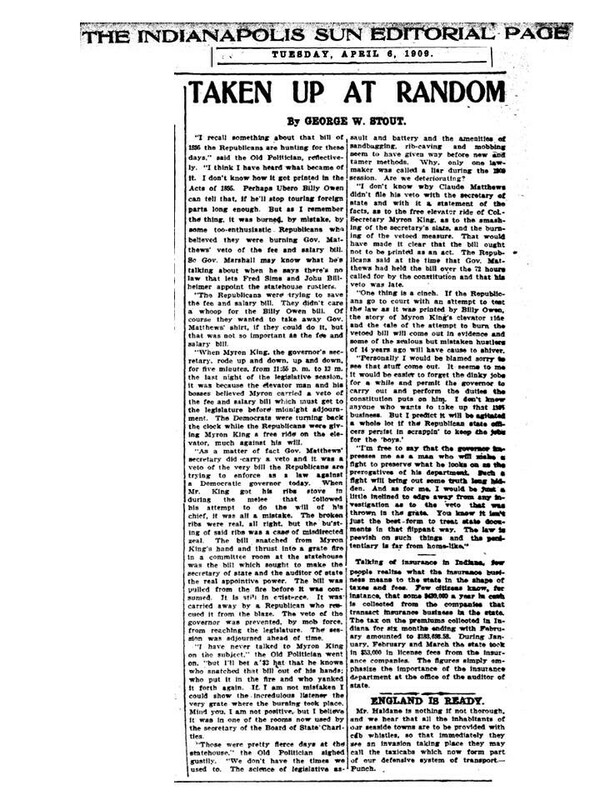 George W. Stout’s editorial column 14 years after the incident noted that “Democrats were turning back the clock while the Republicans were giving Myron King a free ride on the elevator, much against his will.” While Myron King was carrying the Fee and Salary Law signed by Governor Matthews, he also had in his possession the veto of the bill to take away the governor’s authority to appoint the Custodian of the State House. The bill would create a Board of Public Buildings and Property to appoint a Superintendent of the State House. It would automatically become a law unless the Governor’s veto made it back to the Speaker before the end of the session. House Democrats wanted to give King more time to deliver the veto before the deadline; House Republicans wanted to prevent him from getting into the House chambers. 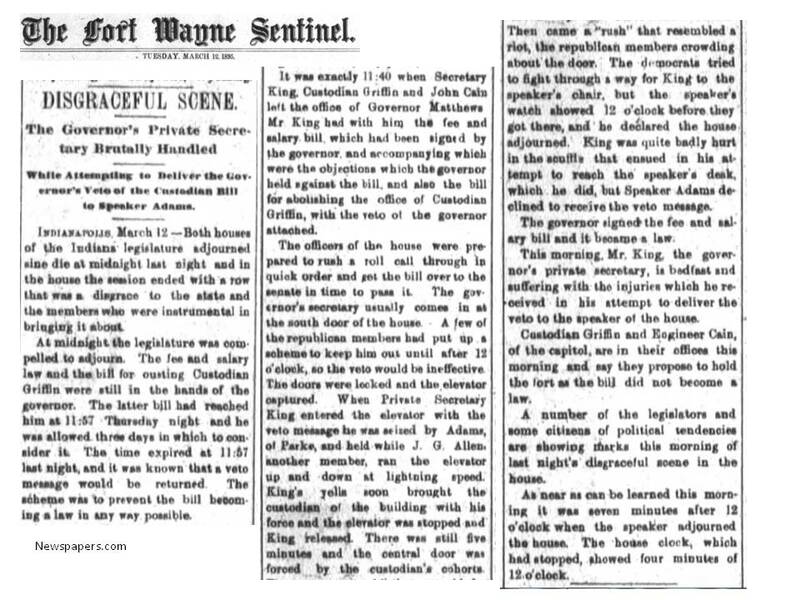 The Fort Wayne Sentinel called the previous day’s events a “Disgraceful Scene” in their March 12, 1895 issue. While the Tuesday morning page one headline of the daily Fort Wayne Gazette called the scene a “Mad Riot” and reported that men “fought like tigers.” Click here to view the PDF of page one: The_Fort_Wayne_Journal_Gazette_Tue__Mar_12__1895_. Research Tip: As previously announced on this blog, Indiana residents can search and view the Fort Wayne papers and other select Indiana papers for free through a partnership between the Indiana State Library and Newspapers.com. via the INSPIRE portal. You will need to register for a free account before clipping, commenting, or saving. 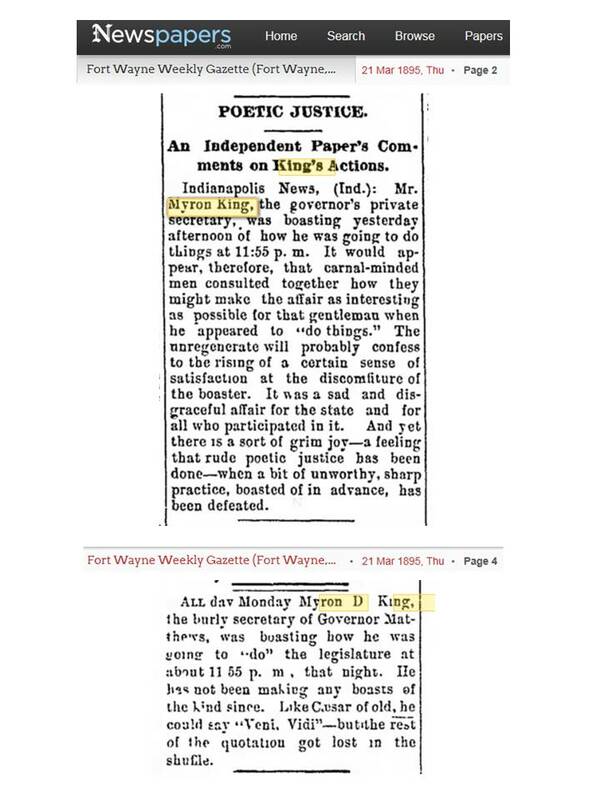 The Fort Wayne Weekly Gazette had a different take on Myron King’s role in the battle as reported and editorialized in their March 21, 1895 issue. Newspapers around the country covered the story, most certainly due to the sensational accounts of events that night. In fact, page one of the Tuesday, March 12, 1895 edition of the New York Times carried word of the Monday evening tumult in Indianapolis, with the headline, “King May Die of His Injuries.” While the headline conveyed sympathy for Myron King’s condition, it was also a prime example of the saying, “if it bleeds, it leads.” The local and national media could not resist covering this event, given the public’s appetite for the most fascinating and bizarre stories. These sort of stories sold papers. Telegraph wire services delivered news readily across the nation, but not necessarily accurately or in an unbiased fashion. 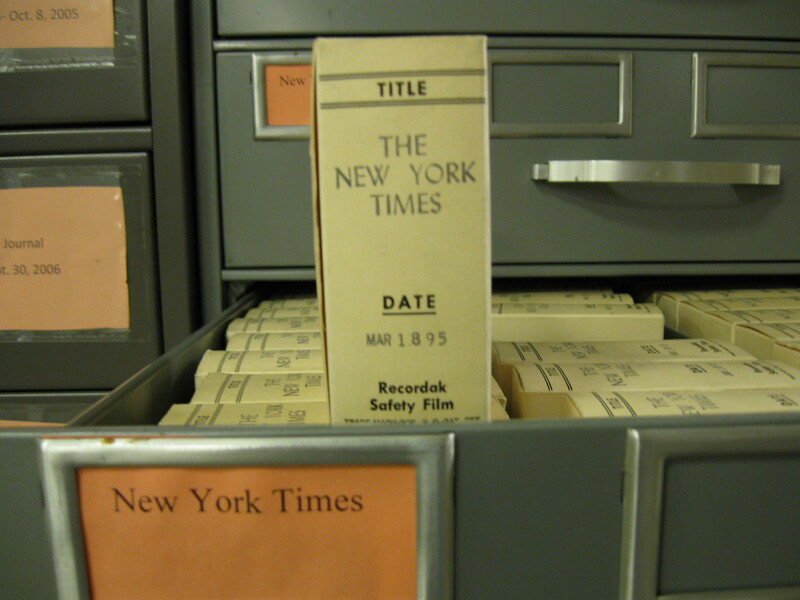 Research Tip: Even without a paid subscription to the historical database, the New York Times archive’s index is a handy and free online tool. After finding an article citation, use the Indiana State Library’s out-of-state newspaper collection which includes the New York Times from May 1852 through December 2007 and the microfilm machines to view the microfilm reels. 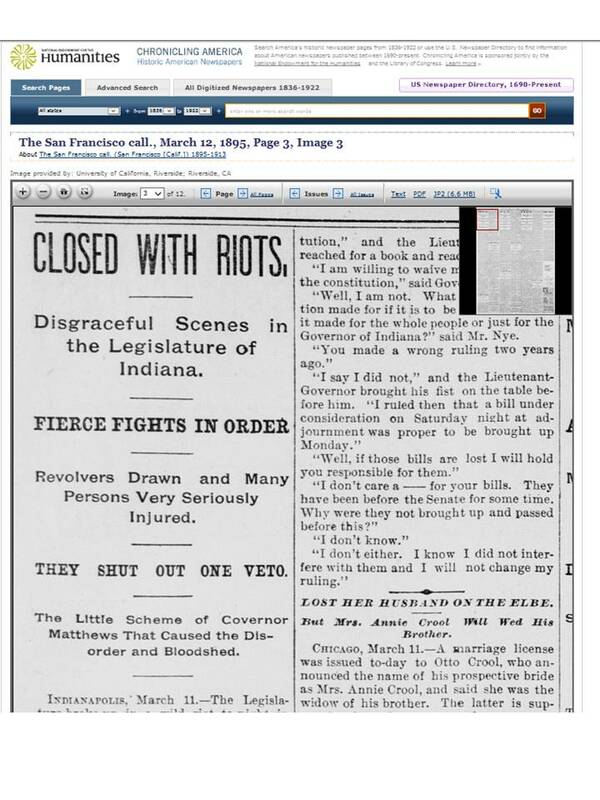 The Indiana legislature “Closed with Riots” according to page 3 of the March 12, 1895 San Francisco Call newspaper. The additional information about revolvers being drawn appears in some accounts, but not all reports in the Indiana newspapers. Research Tip: The Chronicling America website is a comprehensive resource for discovering pre-1923 news stories in digitized newspapers from around the United States. The Indiana State Library participates in this project and receives grant funding to digitize the Indiana newspapers included. Revisiting post-1895 digital newspapers included in the Hoosier State Chronicles, an editorial column asking “Who broke Myron King’s ribs?” appeared in the September 29, 1914 South Bend News-Times. No one was ever charged with battery in the melee. Research Tip: A great resource for historical biographical information is the Indiana State Library’s Indiana Biography (card) Index. 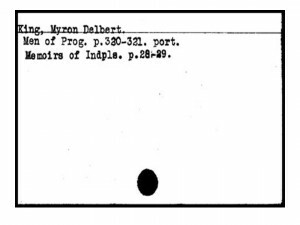 Also available as a free online database, the Indiana Biography Index Published Before 1990 contains images of the original index cards including one for Myron King. Visit the Great Hall of the Indiana State Library to view the card drawers in person! 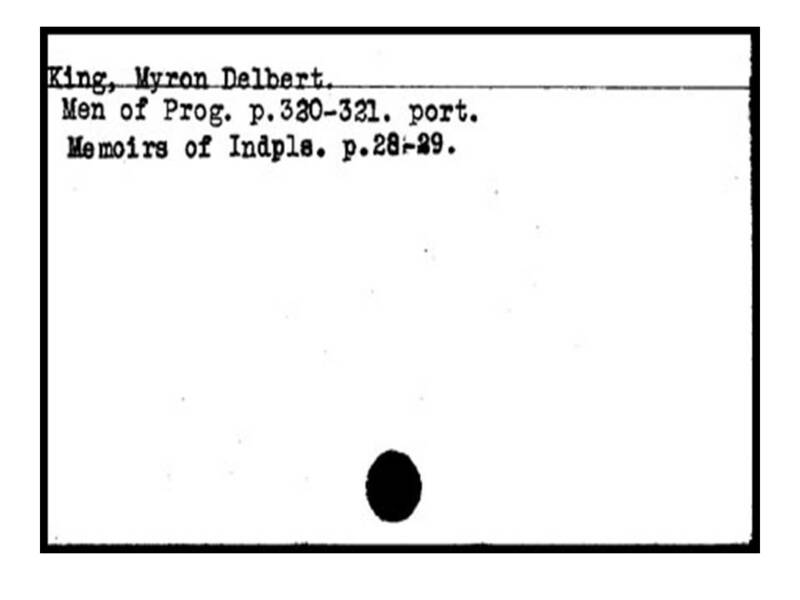 While the index card above only cited two printed volumes, both are in the Indiana Collection and are also freely available in digital format on Internet Archive. 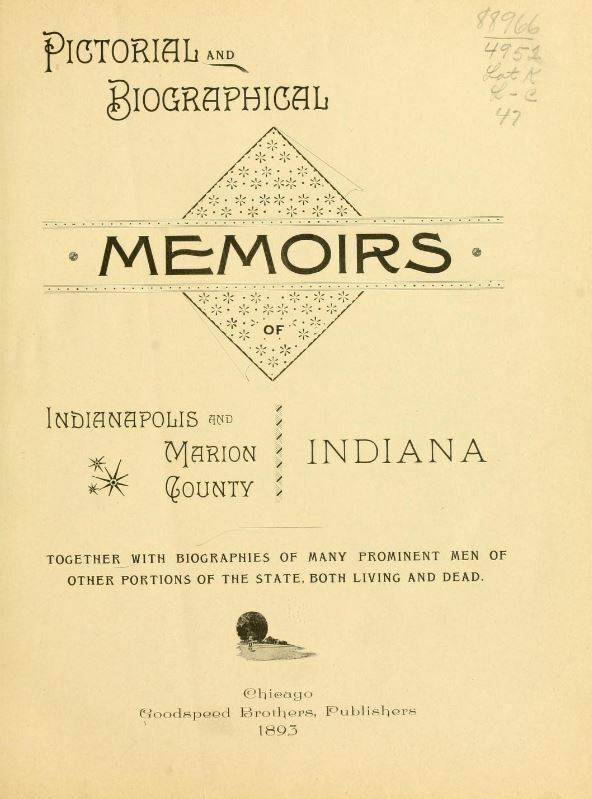 Verifying the complete list of sources cited in the Indiana Biography Index helped to determine that “Memoirs of Indpls.” was the abbreviated title for the book, Pictorial and Biographical Memoirs of Indianapolis and Marion County, 1893, [call number Ind. 977.201 M341]. 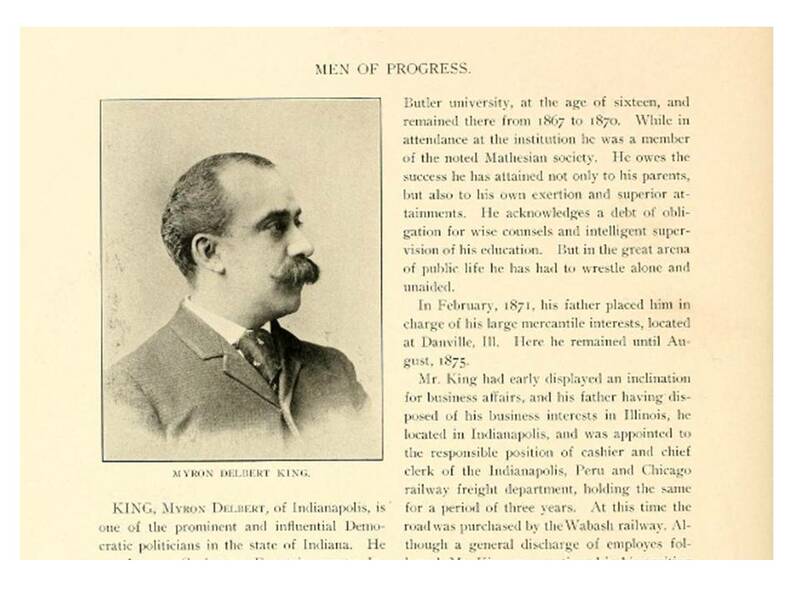 Myron King’s biographical sketch and portrait appeared on pages 320-321 in the book Men of Progress, Indiana, by William Cumback, 1899, [call number Ind. 920 C969]. As was the style of biographical publications from the time period, the entry was most flattering to the subject. While no mention was made of the 1895 incident in the State House, it states that “Mr. 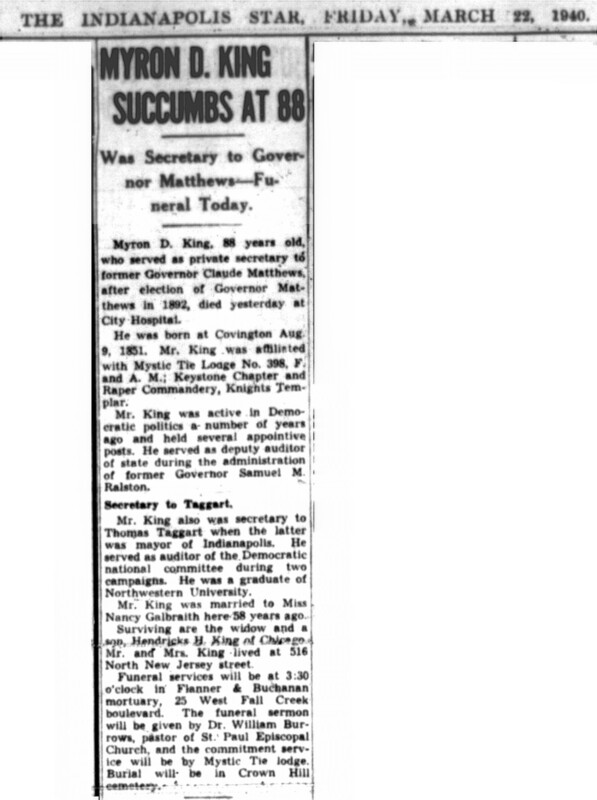 King has always been faithful and untiring in the discharge of his duties as an officer, and especially was he attentive and earnest in the performance of his duties as the governor’s secretary.” As far as this limited research has shown, Myron King recovered enough from his injuries to continue serving as Governor Matthews’ private secretary. Research Tip: A quick check of one of the Indiana Division’s favorite resources, the Indianapolis Newspaper Index, revealed a lone citation. The bulk of the years covered by the index, 1899-1978, are only available by checking the card drawers. Another great reason to visit the Indiana Division at the Indiana State Library for research! 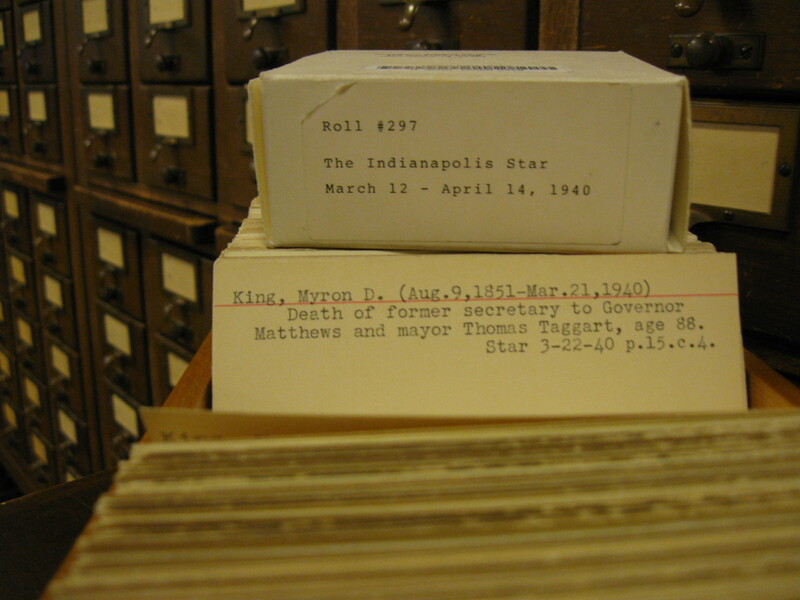 According to the index card, Myron King died March 21, 1940 having lived to the age of 88, and he also served as secretary to Indianapolis Mayor Thomas Taggart. Further examination of the microfilm holdings of the Indiana Newspaper Collection was the next step. Again, the image below was made from microfilm by using the new ViewScan digital scanners. King’s obituary from the Indianapolis Star reveals more of his life and career path. However, no mention was made of the State House incident 45 years prior. While King’s obituary stated he died at City Hospital [later known as Wishard, recently renamed Eskenazi Health], his cause of death from arteriosclerosis was reported in the March 25 vital statistics column of the Indianapolis Commercial newspaper. 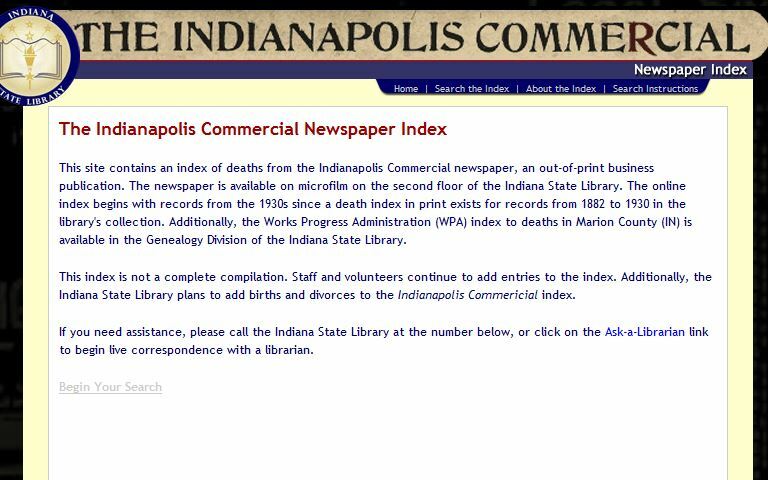 Research Tip: The Indianapolis Commercial Newspaper Index is one of the Indiana State Library’s popular and free online resources, but it is not an obituary index, merely a vital statistics listing. This index can help to provide an approximate time in which to search for obituaries in other Indianapolis newspapers such as the Star, News, or Times. If a person died in Marion County and a listing is included in the Commercial, a good rule-of-thumb is to search the regular newspapers in the week before the statistical death entry appeared. 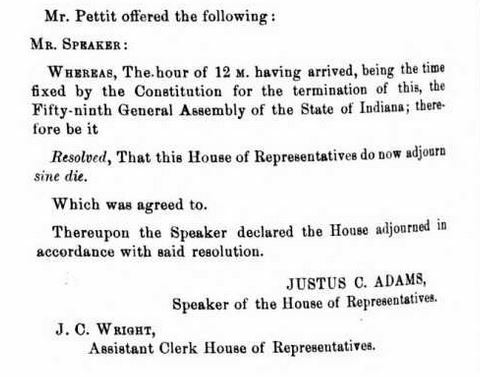 The 1895 Journal of the Indiana House of Representatives recorded nothing of the down-to-the-wire showdown; page 1624 notes that 12 midnight marked the termination of the session. 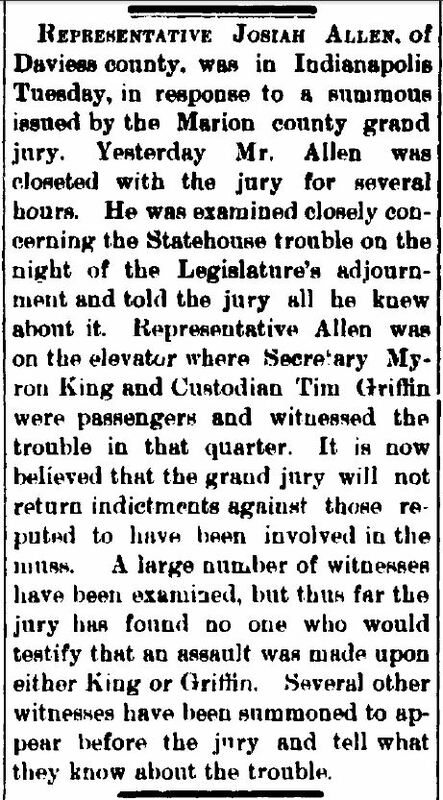 Call it a wild brawl or call it politics as usual, the 1895 session ended with a bit of March mayhem. While the tale of Myron King and the veto battle was largely relegated to the cobwebs of history, with digitized newspapers the sensational details of the event can be rediscovered. This blog post was written by Andrea Glenn, Librarian and State Documents Coordinator, in the Indiana Division of the Indiana State Library. For more information, contact the Indiana Collection Division at (317) 232-3670 or “Ask-A-Librarian” at http://www.in.gov/library/ask.htm.